AMONG THE KEYNOTE SPEAKERS, REPRESENTATIVES OF PROJECT CENSORED ADDRESSED THE BLATANT CENSORING OF 9-11 ISSUES, NOT ONLY BY MAINSTREAM MEDIA BUT ALSO BY ALTERNATIVE MEDIA. THE GROUP HAS BEEN COVERING CENSORED STORIES FOR 35 YEARS BUT HAS RECEIVED AN UNUSUAL AMOUNT OF RESISTANCE—EVEN FROM PROGRESSIVES—FOR COVERING ISSUES RELATED TO 9-11. MICKEY HUFF, PROJECT CENSORED’S CURRENT DIRECTOR, POINTS OUT THAT THESE ISSUES CONSTITUTE ONLY ONE ASPECT OF THE GROUP’S FOCUS. 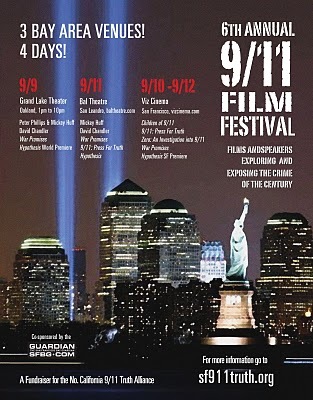 This entry was posted in 911, General, News media and tagged 9-11 Film Festival, Amy Goodman, Bonnie Faulkner, Building 7, Building What?, Carol Brouillet, Flashpoints KPFA, Guns and Butter, KPFA, Mickey Huff, No Lies Radio, Peter Phillips, Project Censored, SCADS, State Crimes Against Democracy by Shawn Hamilton. Bookmark the permalink.